Termination of VoIP traffic in Morocco is a promising direction of telecommunications business, as the mobile sector is well developed there and they have a high average rate. But for stable earnings in this sphere, high-quality Internet connection is required which would ensure reliable operation of specialized equipment. Let’s discuss specifics of the Internet services market in Morocco. A company called Maroc Telecom is leading in the sector of broadband access in the country and it is in fact a monopolist. 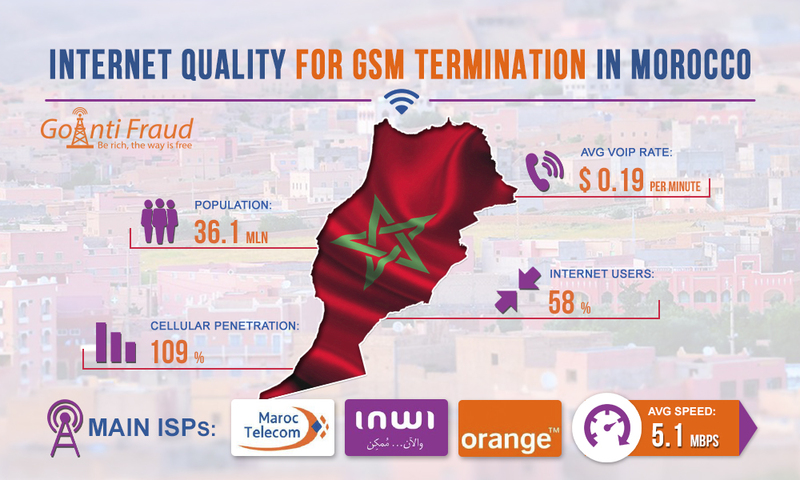 Nevertheless, there are still a small number of providers in the market, including Orange Morocco and Inwi, who provide DSL-based access services, but they have limited coverage. Surprisingly, but even with the monopoly of Maroc Telecom and other market restrictions, the country has one of the lowest rates for broadband services among African countries. And due to the wide fiber-optic networks coverage, Morocco has a high level of Internet penetration of 58% (which is more than 20.2 million connections). At the moment, works are under way to expand national fiber-optic networks. In Morocco, a special program has been launched the objective of which is to provide Internet access to the entire population of the country by 2020. The average Internet speed in the country is 5.1 Mbps. This is a great indicator that suggests that you can operate even multi-port VoIP equipment in Morocco. Considering average voip rates morocco, you can make good money on voice traffic termination by locating the gateways in this African country.